I had intended to make James Bond-themed cupcakes for today. In fact, I had a truly smashing idea for Bond-themed baked goods but had to put it aside because as much as I’d love to, I can’t really take an entire day off just to bake. Even if it is for something as fabulous as James Bond Day. In the end though, I didn’t even have time to make the cupcakes. Gutted. They’ll have to wait until the release of Skyfall, which apparently won’t be released in New Zealand until the 22nd of November. Excuse me, what? We have to wait a whole month after its release in the UK?!?! Not on, chaps, not on. So, no James Bond cupcakes today, but I’ll leave you with this utterly appropriate “James Pond” cartoon from one of my favourite websites, Shaaark! 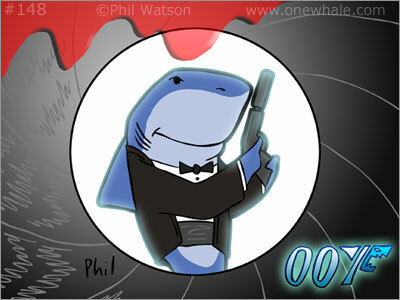 James Bond and sharks. Clearly a fantastic combination – what more can one ask for? Have a marvellous James Pond Bond Day, wherever you are in the world! PS – I wanted to pepper this with awkward Bond quotes, but there were just too many to choose from. I struggle to even pick a single favourite. Do you have a favourite Bond quote? It’s Easter! It’s spring! No wait, autumn! Uhm what? 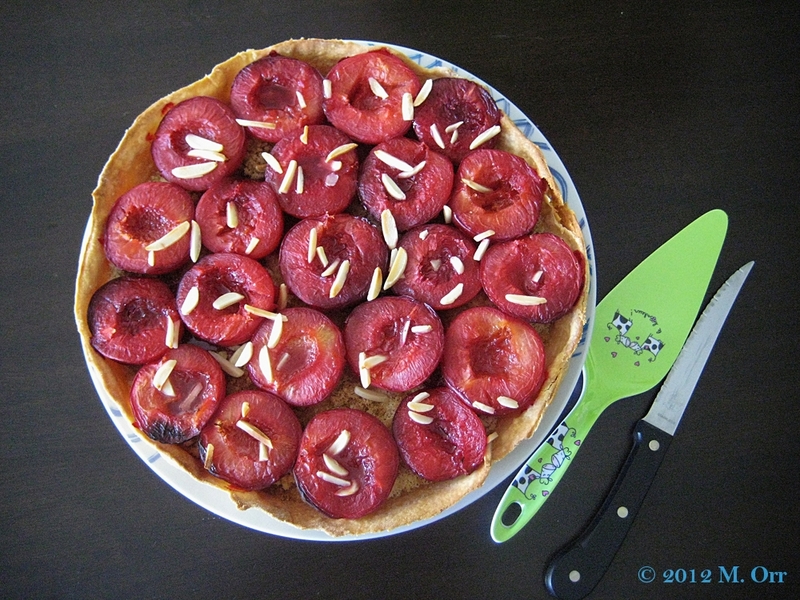 I’d only planned on briefly mentioning my confusion over spring-themed Easter cards in autumn and the baby sharks before getting to the main point of this post: a plum and almond tart. 450 words into the post, I’ve only just mentioned it. Woops. Clearly being a post-grad has done nothing to help me write more concisely and keep to the point… Despite not celebrating it, I felt a bit odd letting Easter slip by unmentioned. In my family, it has always been an occasion that involved good food (ok, not so much if my grandma was cooking, but whenever my mum was in charge, everything was delicious). Since it’s autumn, lamb is obviously not on the menu today for me, but it just felt so weird posting a recipe with butternut squash or venison for Easter. So I thought I’d go for a dessert (you know, for a change). Something chocolate-y would have been the obvious choice, but it just feels too warm outside for chocolate. I want to eat fruit! I was going to go down the apples and pears route, since they are very much in season at the moment, but then I got distracted by what must be the very last plums of the season. 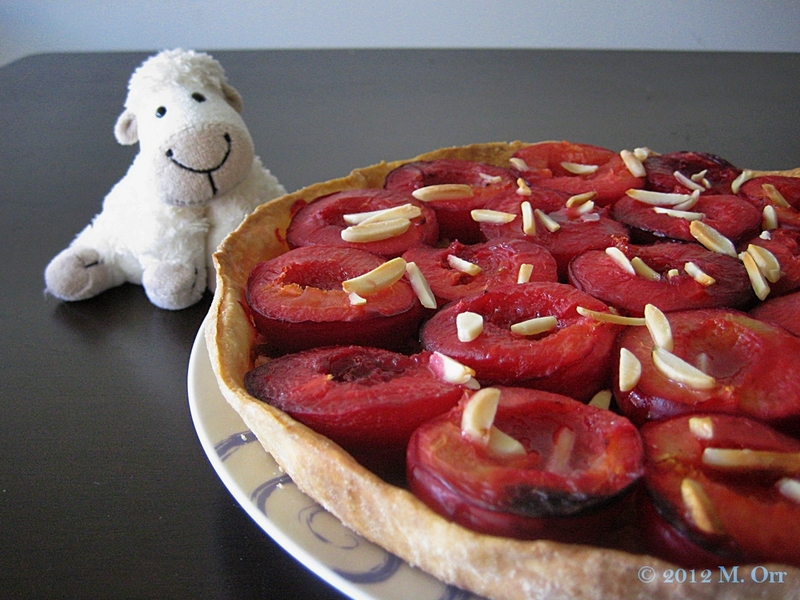 As soon as I saw them, I knew exactly what I was going to make: plum and almond tart. I adore tarts (har har har, etc.) – they’re so basic to make that it’s difficult to go wrong. And their simplicity is what makes them so delicious. I would almost always pick a fruit tart over any other kind of dessert (except perhaps crème brûlée). This tart is no exception. Pastry. Sugar. Ground almonds. Plums. A bit more sugar. Oven. Boom, done. Simple as (good Kiwi expression that – though simple as what, I have no idea). Oh and I threw a few slivered almonds on top, too, just for effect. The plums turn all juicy and delicious in the oven, the ground almonds soak up any overflowing juices, and the sugar adds just the perfect balance of sweetness. This would make a perfect end to a huge meal, or just an afternoon snack. It’s a little difficult not to make a bit of a mess of the plums when serving the tart, but it’s so delicious that you’ll quickly be forgiven! 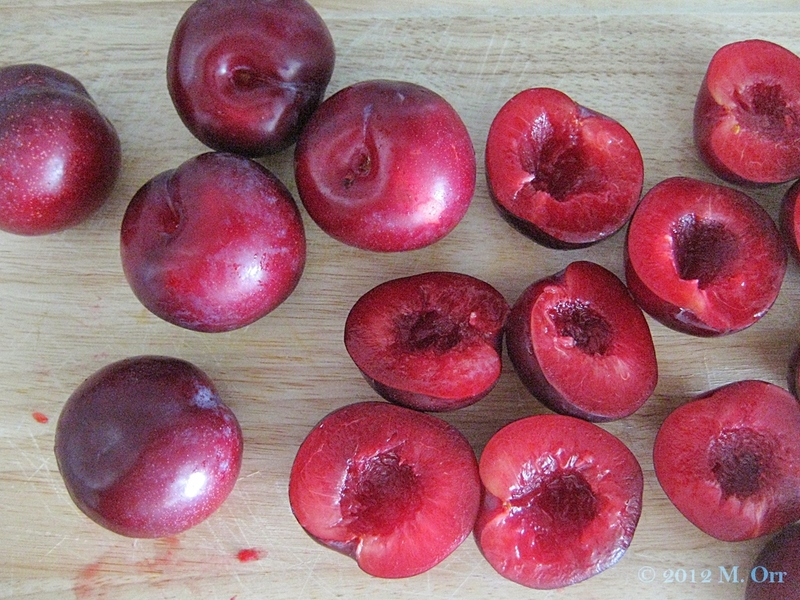 The amount of plums required obviously depends on the size of the plums and the size of the tart tin that you’re using, but as a rough guide, I used a dozen medium-large plums. This tart is best eaten the same day that it is made as the pastry will start to go a little soft if left out for too long. 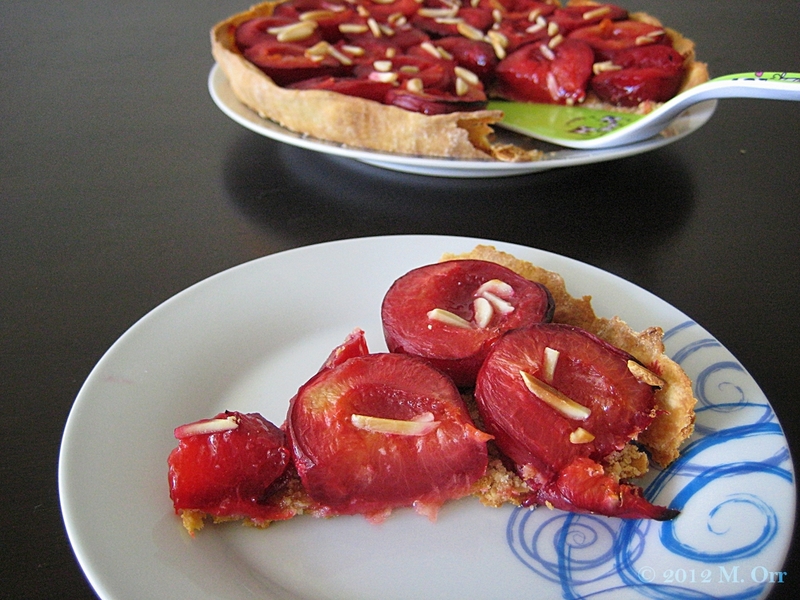 Add more sugar if you are using particularly tart plums. 1. Butter a 24 cm fluted tart tin and dust with flour. Roll the pastry out to a thickness of about 4mm and line the tart tin with it. Trim the edges and prick the pastry with a fork. Leave to rest in the fridge for about 30 mins. Pre-heat the oven to 190°C. 2. Meanwhile, cut all the plums in half and remove the stone. Set aside. 3. Line the pastry case with a sheet of baking paper and spread baking beans evenly over the paper. Blind-bake the pastry for 10 mins. 4. Remove from the oven, remove the baking beans and baking paper, and sprinkle the base of the pastry case evenly with the ground almonds and about 20g of the sugar. Add the plums cut side up (so the round bit is against the pastry case), as tightly packed as possible. Sprinkle with about 40g of the sugar and bake for 15 mins. 5. Sprinkle the slivered almonds over the top of the plums and bake a further 10-15 mins (the plums should bake a total of 25-30 mins). 6. Remove from the oven and allow to cool fully on a wire rack. Sprinkle with the remaining sugar just before serving. 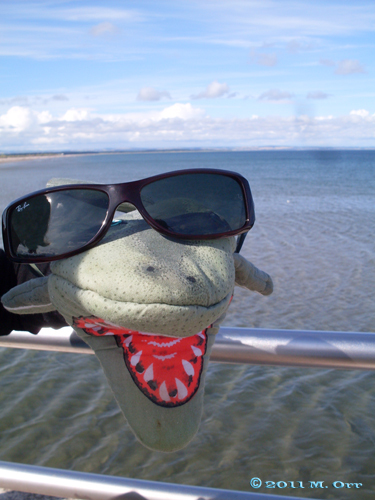 A big toothy sharky grin for 100 posts! I can’t quite believe that this is my 100th post. I can’t quite believe that I’ve published 99 rambling stories, recipes and anecdotes, and that people have actually been reading them. I find that amazing. To celebrate my 100th post, I was originally going to share what I’d learnt from blogging, or something along those lines, but my blog’s birthday is next week, so I’ll save my ground-breaking insights for that occasion (don’t hold your breath). So instead, I thought I’d do something a little different. If you’ve been following my blog for a while, you may remember that to celebrate my 50th post, I introduced you to my oven gloves, the inspiration for my blog’s name. As might be obvious from the name Sharky Oven Gloves and the fact that I have two shark-shaped oven gloves as well as a shark mug (which crops up in photos occasionally), I love sharks. 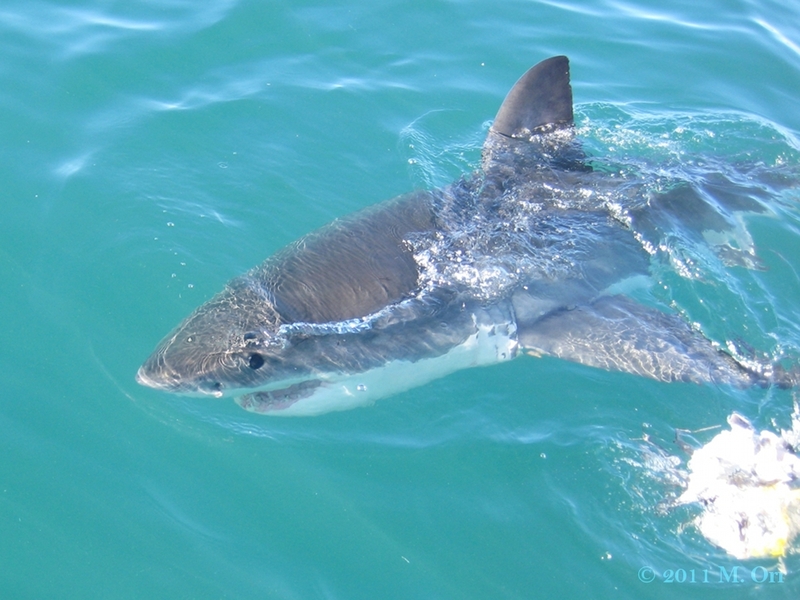 So I thought I’d share three of my favourite photos of real live sharks that I took whilst doing an internship at a research lab in South Africa about three years ago. This shark was far more cooperative, and even grinned for the camera (anthropomorphism? What anthropomorphism?) 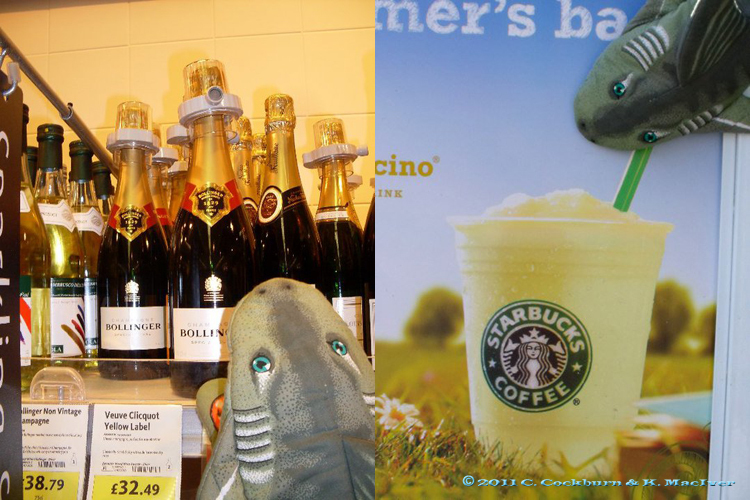 – clearly a diva shark. Her fin isn’t quite entirely out of the water, so it’s not ideal for identification, but if you look closely, you can see that there are a few notches along the straight edge, and those are what make the fin individual, along with colour blotches and scars (those this shark has no examples of those). 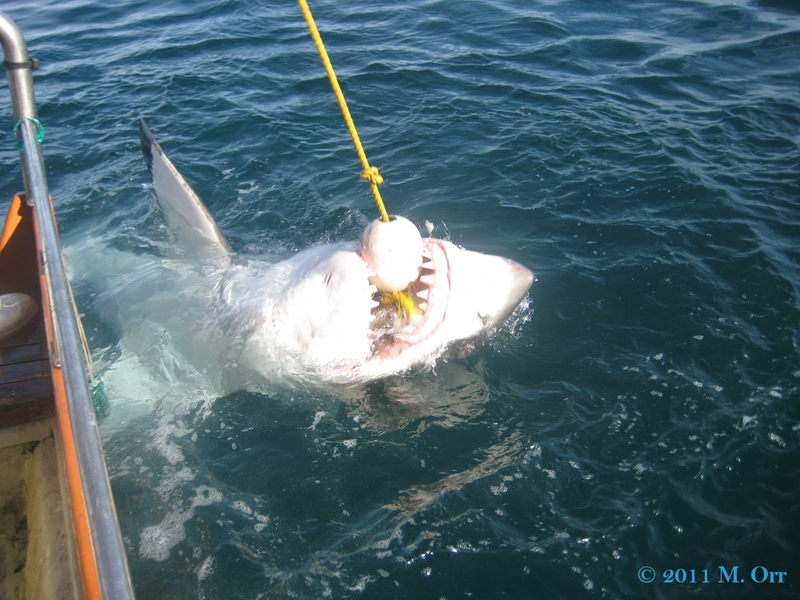 Contrary to Jaws, great whites don’t usually swim along with their fins sticking out of the water, which is why a bait rope is used to try and get them to the surface and close to the boat (wait, what, that film wasn’t an accurate portrayal of Great White behaviour??? No way!). 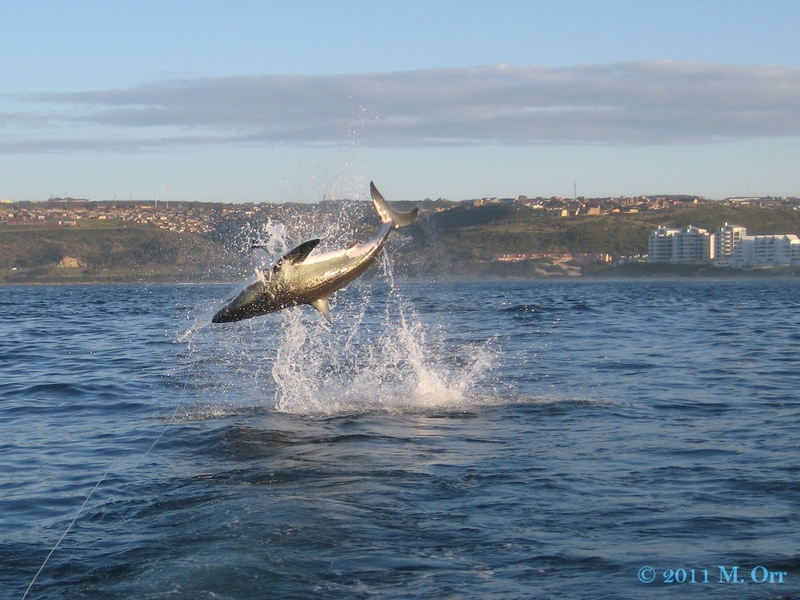 As for this shark, well, she literally jumped for joy at the prospect of being featured on my blog. Her little five minutes seconds of internet fame. That is an actual great white somersaulting out of the water, by the way (before anybody tries to tell me that sharks don’t do that, and am I sure it’s not a dolphin?). 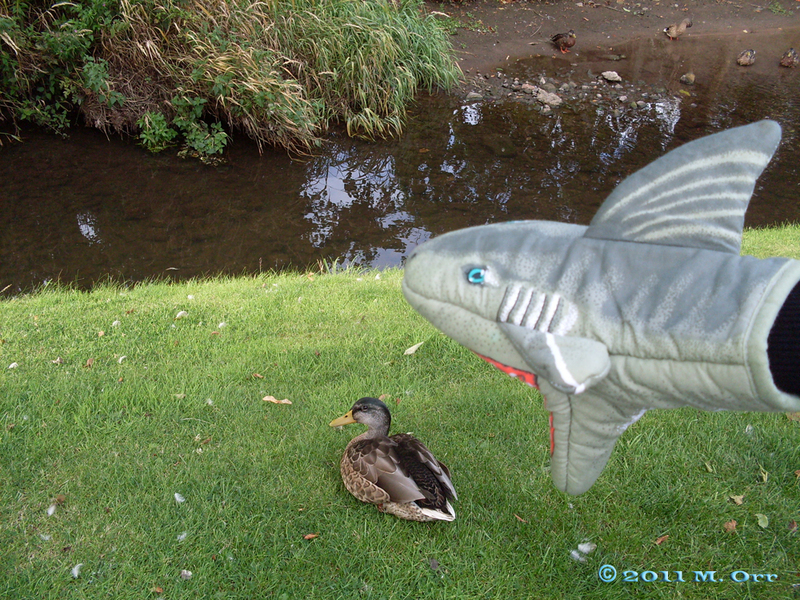 Have you ever seen the footage of sharks hunting seals by ambushing them from below in documentaries? If not, you can find a clip from BBC Planet Earth here (it involves seals getting munched on by sharks, so don’t watch it if that will upset you), narrated by the amazing Sir David Attenborough, who graduated with us in June as an honorary graduate. So we’re practically the best of friends, Sir David and I (I wish). So on that exciting note, thanks for indulging my shark over-enthusiasm (I know it’s not shared by everybody…). Enjoy the rest of your day! May I present… My oven gloves! I’m sure I’ve previously mentioned my love of sharks, but in case you’re not up to speed on it, basically, I’m fascinated by them. 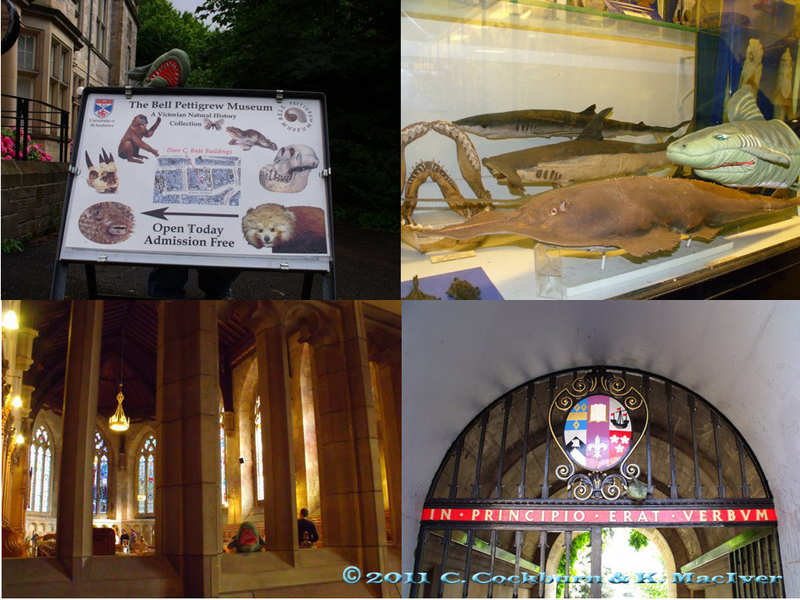 Ultimately, I’d like to go into academia and study sharks. My friends have realised that anything shark-themed makes me totally happy, which makes buying presents for me fairly straightforward (aside from the minor detail of actually finding shark-themed gifts). 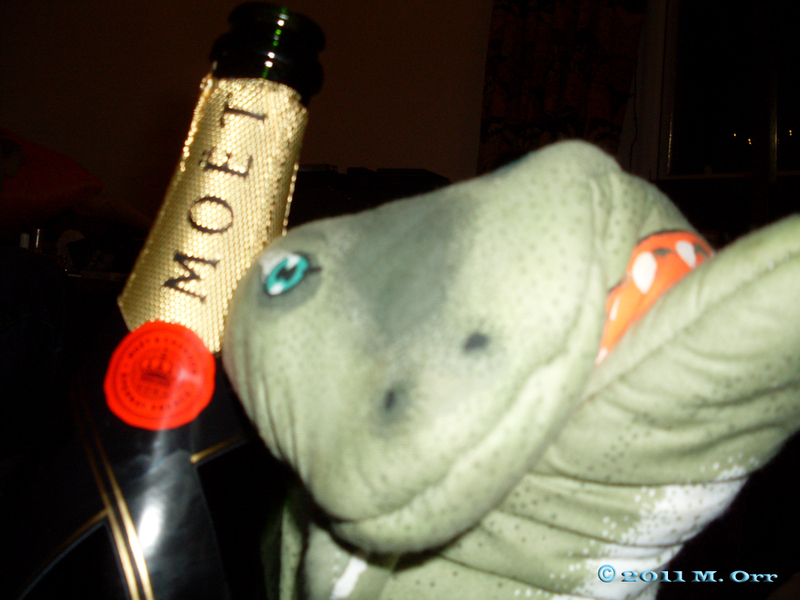 About three years ago, my flatmate gave me a shark-shaped oven glove for my birthday – a truly amazing present! Through a series of totally unexpected circumstances, Kat ended up living with me last summer (2010) and Craig, who was also in St Andrews over the summer, spent quite a lot time with us. Our summer involved baking a lot, eating a lot and drinking a lot totally responsibly. Craig and I introduced Kat to the old James Bond films (we worked our way through the entire set). 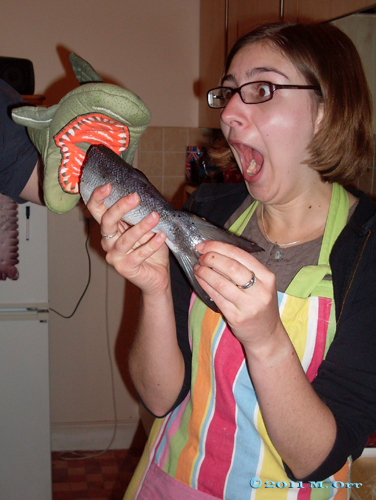 We also discovered that a shark-shaped oven glove has a lot of potential for hilarious photos. By the time we watched The Man with the Golden Gun, shark oven glove photos were a fairly permanent feature of our evenings (not as sad as it sounds…), and we’d decided that we wanted to name the oven glove something Bond-related. Christopher Lee plays Scaramanga (the “bad guy” with the golden gun), and he’s just a fantastic actor and we also happen to be Lord of the Rings fans, so we decided to name the oven glove Toothamanga, or Toothy for short. 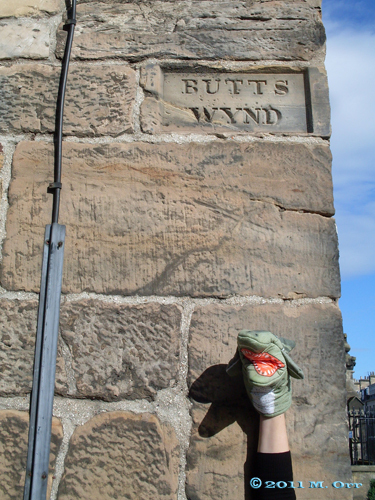 In case you think your eyes might be deceiving you, yes, there is an actual street in St Andrews called Butts Wynd. Now, it’s all very well having a shark-shaped oven glove, but sometimes you need two oven gloves. Most times, actually. Since we spent a lot of time baking, I complained about this a lot over the summer. So Kat, being the amazing friend that she is, gave me a second shark-shaped oven glove for my birthday (it’s in September, so at the end of the summer). 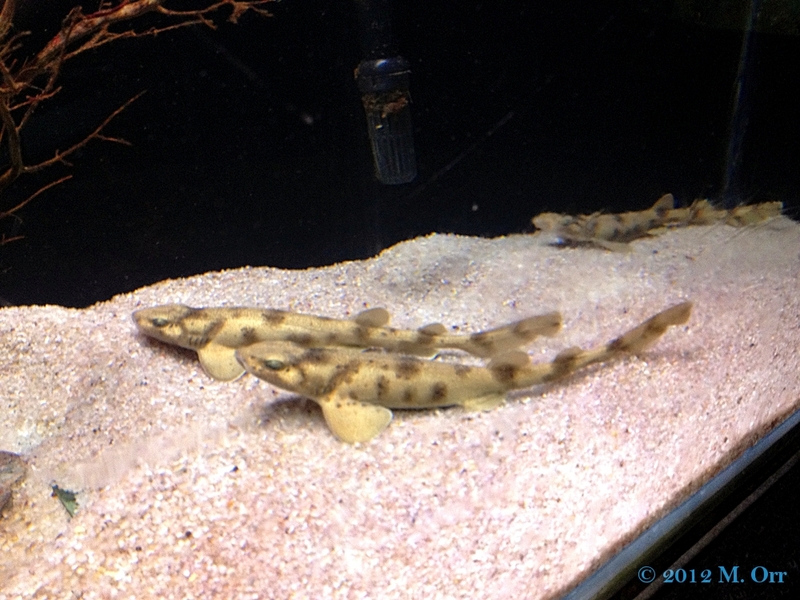 We named it Toothy-Two, or Twothy (see what we did there?) Being working oven gloves, they have of course accumulated various stains, and that’s how we tell them apart (though Twothy also seems to be made of slightly thinner material – possibly on account of the recession?). So there you have it – the rather long-winded story behind Sharky Oven Gloves! 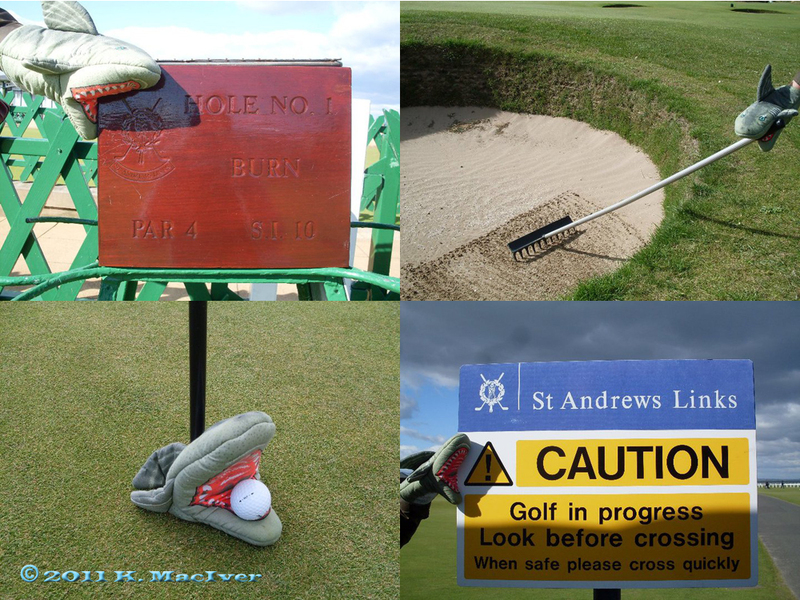 Here’s a final selection of photos, all golf-related – after all, I hear that St Andrews is famous for it…! Hmmmm… Perhaps I have lost the plot!